We make small and medium enterprise smarter. Market variables change continuously. Our solutions help companies become better prepared. Connect SAP with third party web applications. 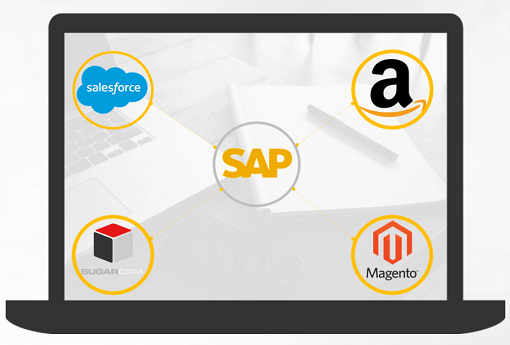 Save time and money by leveraging our pre-configured connectors for integrating Magento, Salesforce, BigCommerce and SugarCRM. We support custom integration projects as well. Empower your business users with the cloud based leaders in customer relationship management solution. Delivered out-of-the-box with endless possibilities to customize the solution over and above the base connector. Magento, arguably the most popular e-commerce platform on our planet, delivered integrated with ECC solution to receive master data and capture real time transactions into SAP. Fast track deployment and enormous savings are key to launching your multi-channel e-commerce solution on top of SAP. Get started with the most renowned commercial open source CRM platform for small and medium enterprises with the thought leaders in this space. Adapt SugarCRM to fit your business needs and integrate it with other applications to make the best use of the solution. What’s more convert SugarCRM into a revenue generating platform for your business. Following are our services in this area. 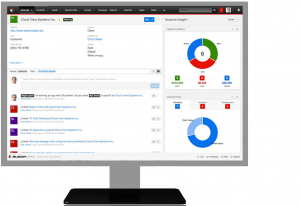 Just like any other platform, SugarCRM has to be customized to meet business objectives. Our SugarCRM Experts make your task much easier by understanding your business needs, identifying gaps vis-à-vis SugarCRM and bridging them. Enjoy our accelerated deployment methodology for faster go to market. Many companies have used our services to make revenue generating platform for them. The key benefit of using SugarCRM as a platform has been the time-frame and robustness of the application. Moreover features like Studio and Administration Workbench and Role Management keep the application robust. There are two prime reasons for migrating to SugarCRM – Flexibility and Affordability. Many organizations working on other applications like Salesforce, MS Dynamics, Zoho and Goldmine have switched to SugarCRM. Our core expertise lies in ETL process which help companies migrate in a much more effective manner. Integrating SugarCRM other applications leverages the underlying concepts of SOAP and REST APIs. Some of the integration work we do, as far as SugarCRM is concerned is with QuickBooks, MailChimp and JBilling. Your web store needs experts who can design, maintain and enhance your e-commerce stores in the best effective manner. Our services are oriented in a manner that you can reap long term benefits and orient your stores in a way which maximizes the turnovervada is loaded with useful features, each one with its own meaningful purpose. We listen to our users and integrate their feature requests on a regular basis. Avada is not only built by us, but also by our users. We design stores which are oriented towards maximizing business outcome. Be it taking care of user experience, optimizing the web pages so that your store attracts maximum traffic or working on add-ons, we offer the complete package. Your Magento is live and has become a profit center for your business. You wouldn’t want it to be offline even for a single moment, isn’t it? Our support staffs provide stringent service levels within your budget and time-zone. Enjoy peace of mind and gear towards growth in the coming times. Your e-commerce store is not the only application in your landscape. You need it to exchange data with other applications like payment gateway, ERP, helpdesk management solution and other custom developed applications. A higher automation means lesser chances of stock out and scalable operations. Our delivery methodology, communication methods and quality levels are designed for maximum customer satisfaction. Some testimonials from our awesome customers.